We currently maintain approximately 300 moorings in Yarmouth and on Casco Bay. Moorings are safe as a dockside berth and sometimes preferable as they are less taxing on boats. Moorings are designed to withstand challenging weather and tides. We set and maintain moorings in most of the boarding Casco Bay and aware of the rules and regulations. These regulations are designed to maximize the safety of your vessel as well as other vessels in your harbor. The idea of the automatic mooring service plan is to eliminate your concern with your mooring/s needs each year. Casco Bay mooring will handle all the required maintenance as well as handle communication and inspections through the Harbormaster's office. Thus you will have a mooring that is "turn-key" and ready to use each year. We will notify you automatically email of your moorings status each spring and fall. Please understand that due to normal wear and tear, all mooring gear will eventually wear out. As part of our auto service, we conduct a visual inspection of all mooring gear visible at the surface each fall, including pennant, swivel, mooring ball, the top of the mooring chain and any shackles at the water line. For each mooring we also remove, clean, grease, inspect, repaint and re-install the ball, pennant, and any shackles and swivels at the top of the mooring. Your mooring chain is dropped to the bottom so no wear is incurred during the winter. Included in each town's regulations are regular complete inspections these are typically conducted in the spring and results are submitted to you and the local harbormaster to confirm all tackle is in good and serviceable condition and meets the necessary criteria for that vessel. Arrange inspection as needed (bi-annually) with Harbormaster's office and verify any inadequate hardware. Generate a report and replace inadequate hardware at no additional labor cost. (Materials will be charged) See Product Prices Here. Set mooring at designated lat/long coordinates per Harbormasters office or remove winter spar and replace with your standard mooring ball. Move mooring to approved winter storage area OR install winter mooring spar. Clean mooring ball, lubricate shackles/swivels and store at our shop. Permit Process: Sometimes obtaining a mooring can be a daunting task. We can assist you with filing your permits or applying for a mooring in your local harbor. Be aware that some municipal waiting lists often taking years while others with ample space and availability. Installation: We can provide you with a variety of mooring solutions to fit your individual needs. We install granite blocks, mushroom anchors, along with all the chain, shackles, swivels, pennant lines, mast bouys needed to complete your mooring. All our mooring recommendations take into account the size, weight, and windage of the boat, the depth of the water, the area where the mooring will be placed, as well as local regulations regarding the size and scope of the mooring. It is our goal to ensure that all customers feel confident that the products and services we provide are of the highest quality. Inspection and Repair: Here at Casco Bay Mooring, we feel strongly that regular inspection of all mooring gear is critical for ensuring a safe harbor/mooring field. We inspect moorings within greater Casco Bay and will work with harbormasters. Whether we perform a dive inspection or a pull inspection, we will always provide you with a written copy of our inspection, which clearly identifies the strengths and potential problems with your mooring. If any deficiencies are identified, we offer competitive pricing for all mooring repair work to help make your mooring safe and bring it into line with local regulations. Mooring Relocation: For those occasions when your mooring needs to be relocated, we will work directly with the local harbormaster to help ensure your mooring is moved to a spot that will work with your boat. Mooring Winterization Services: Mooring winterization consists of removal and cleaning of the pennant float and line, installing a winter stake on the mooring to mark it, and covering and storage of your mooring float for the winter. We also complete a visual inspection of the upper portions of your mooring and will send you a written estimate with your winterization bill if any repairs are needed. All mooring are typically winterized by end of December. In the spring, we will remove the winter stake and put your mooring float/pennant line back in the water, painting numbers on the ball if needed and completing any repairs. All our moorings are typically de-winterized by early May, and can be made ready earlier in April upon request. 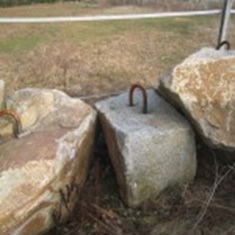 Anchor - typically a granite or concrete block ranging from 1000 to over 6000 pounds with a galvanized eyebolt on the top, or in some locations with soft bottoms, a mushroom anchor. Galvanized chain - typically ranging from 1/2 inch to 1 inch in diameter. The length is determined by the depth of the water and mean tidal changes. 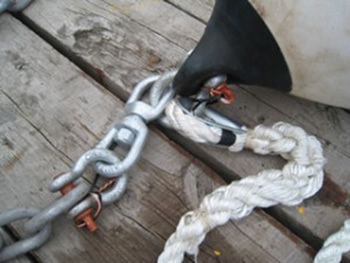 Mooring ball - we recommend a hard ball that allows the chain to pass through the ball, thereby keeping the majority of the terminal tackle out of the water and your vessel securely connected directly to the mooring chain. Nylon pennant - either a 3-strand-braided or double-braided with a built-in galvanized thimble to reduce chafing. 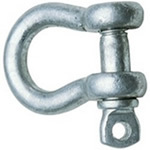 Galvanized shackles and swivel - typically ranging from 1/2 inch to 1 1/2 inch, this hardware both connects all aforementioned gear and allows the tackle to freely spin, which reduces twist in both the chain and pennant. We currently maintain Town of Yarmouth floats as well as many private docks among the many island of Casco Bay. 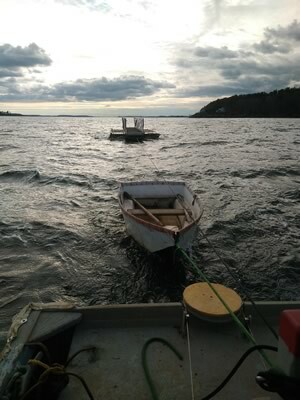 We disconnect the floats and ramps from the docks each fall and take them out of the river, or store up inside island coves per instruction, then reinstall each spring. We inspect the floats, ramps and docks each year as we connect and disconnect them to proactively identify any hardware that may be in need of replacement or any other issues that may cause problems in the future. And if needed, we have rebuilt and rehabbed older docks in need of repair. Stewart Hunt as been a certified diver for over 30 years. Stewart began his commercial diving work scallop diving in the 1980's when sea scallops were abundant in Casco Bay. We are available for your needs or emergencies. We can dive for prop issues lost items, and deeper mooring inspections. Shrink Wrapping: Casco Bay Mooring also offers safely shrink wrapping boats for winter storage. A convenient option for protecting your boat through the winter months, we offer competitive pricing and will guarantee our work. If you experience any problems with your shrink wrapping, we are available during the winter and will return to fix it. To check out sizes and prices of these items: Click Here on our products and prices page. Casco Bay Mooring sells a variety of mooring products. We have most hardware products for moorings on hand, and most other products can be ordered and available for delivery within a day or two. If you do need mooring tackle, be sure to check our prices here, Casco Bay Mooring is very competitive and glad to make sure you comply with local requirements. We have very low overhead and have wholesale accounts with several marine suppliers. If we do not have an item in stock we can almost always have it at our door within a day. Chain: We sell primarily domestic chain manufactured by Acco/Peerless. We typically stock 3/8" to 1" chain sizes. Shackles: We stock sizes from 3/8" to 1 1/4" load rated shackles. We only sell shackles that are marked either "WLL" (working load limit) or "SWL" (safe working load). Although they are a more expensive option, shackles that are not load rated should never be used for a mooring. Swivels: This is often the weakest point of most moorings and the most common place for failure. Swivels are typically replaced every three years. We recommend either a 3/4" or 7/8" swivel. If you are unsure about the wear on your swivel, we would recommend replacing it. Pennant Line: We typically sell Yale braided lines as it is our preference but also supply custom made pennant lines. A typical pennant line we sell is made with 1/2" to 1" three strand nylon line and a heavy duty thimble. These cost an extra dollar but are worth the small investment. The average life of a pennant line is approximately three to four years. Mooring Balls: We have several different sizes and types of mooring balls on hand. Styles include hard plastic with shackle pocket, inflatable polyform balls (bottom connect or through ball), Our experience has found that the PVC style works well in most areas where there is current because you don’t have the problem of a shackle scratching the side of your boat. We would be happy to discuss further the benefits and drawbacks of the various styles depending on your situation. Mast Bouys: While not a necessity, a mast buoy can make picking up your mooring much easier, particularly on a boat with a high freeboard. Despite their convenience, mast buoys can break particularly where the hole is drilled to attach the float. To alleviate this problem, we have designed our mast buoys with a heavier rod (3/8") and we do not drill holes near the float when we attach the rods. Another drawback to mast buoys are that the rods are often made of fiberglass, which splinter after a few years. We offer a poly coated rod to avoid this problem. Our mast buoys are also constructed with larger counterweight, which helps your mast buoy stand upright in high current or rough areas.